Firstly, I'm new to Skin79 and this is the 1st time I'm attending their preview. It was an eye-opening experience for me as I hardly use BB cream now. The charming hot pink and vanilla white decor of The Icing Room blended in harmoniously with the girlish packaging of Skin79's. Couple that with delectable, dainty little pastries and the whole scene was overwhelming with saccharine sweetness! Lorraine ran through the range of products offered and we all got to try it out for ourselves. 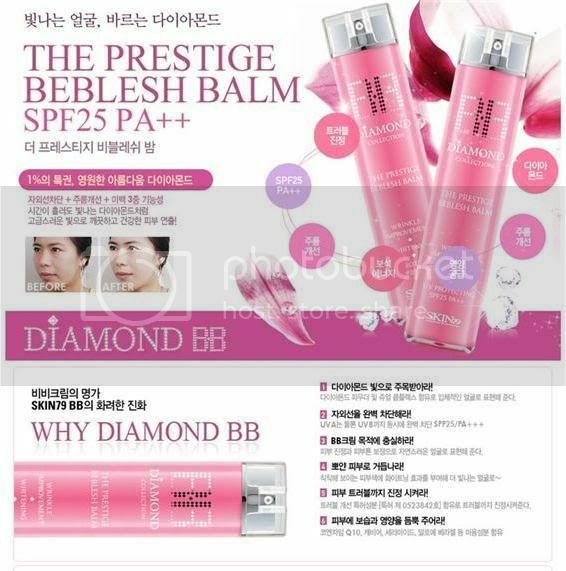 Skin79 is famous for their BB cream and it's the best-selling BB cream brand in Singapore. There's currently 2 categories in the Diamonds range. Contains Diamond powder and Jewel Complex Powder of ruby, amethyst, coral and tourmalin and pearl, combined with skin care properties to create flawless complexion! Excellent nourishment with skincare effects of jewels & peptide MX complexes to keep skin looking smooth & bright. The unique aspect of BB cream is that it has 1 shade only and will blend according to your skin tone once applied. Amazing, eh? Incomparable radiance & shimmer of the 5-color refined and luxurious ball powder. It gives a really pretty overall shimmer, you can use it on your face & body too. Transparent and luxurious look, this sunscreen pact helps maintain soft, fresh, shine-free complexion. Highlighting BB cream with luminous pearl shimmer for a glossy and fresh look. You can use this around the eye area, especially under your brows to highlight and make eyes appear bigger. It also comes with a detachable brush so you can wash it regularly. Really hygienic! The cream comes out of the brush whenever you give it a pump. Upgraded formula with Diamond Powder, Flora Bouquet Complex & Blooming Jewel Complex consisting of 5 jewels including amethyst and ruby, making skin shimmer and shine like jewelery. Fine Pearl BB Cream with built-in dual types Pearl Highlighter, to enhance skin radiance and provide 3D effect in accordance with light angles. Fine powder adheres softly to the skin, while sunscreen maintains a shine-free face. Dual shade concealer that naturally covers skin imperfections and provides natural coverage to dark under-eye areas. Really interesting as there are 2 shades so you'll be able to find the right shade to conceal an imperfection. Diamond powder with jewel complex that is easy to apply, light and soft on the skin. Do head down to WATSONS to get your Skin79 fix if you're lemming for any of the above. They have a promo pack available now at a really affordable price! And it was not just all talk and no play for us, we were each given a muffin to decorate. Something the inner child in me could not resist not indulging in... However, as you can see I am pretty bad at it. The best decorated muffin got a little surprise - a tiara! Really cute! I think I can check out DIVA for my wedding tiara. Anyway, the winner is Sara, I heard that she's a design student. And last but not least, a goodie bag was given to all the bloggers who attended. Really excited to try out the stuff!